Las Vegas themed wedding favors are so hot now. Poker parties are the trend for bachelor and bachelorette parties. 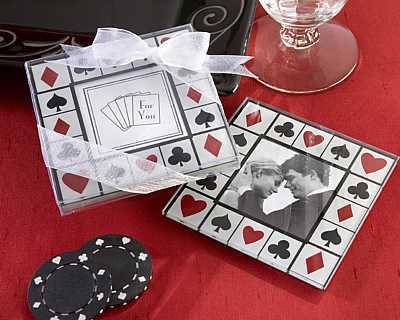 These wedding favors are also great for "Lucky in Love", "Don't Gamble on Love", and "A Sure Bet" wedding favors. 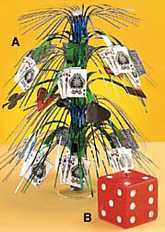 Personalized playing cards, chocolate playing cards, chocolate poker chips, and poker sets are some of the items that you will find here in this Las Vegas themed wedding favors section. These cute candy slot machines are great for Las Vegas themed wedding favors. They are perfect for kids and adults. 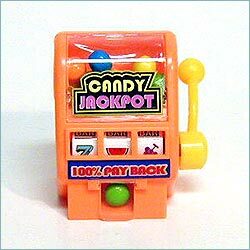 The candy slot machines are sold in a set of 12. Price is per set of 12 assorted color candy slot machines. Chocolate Covered Oreo Cookies - Cellophane bags & ribbon Wow! Nothing could be sweeter! Chocolate covered Oreo cookies. You may choose white chocolate or dark chocolate. 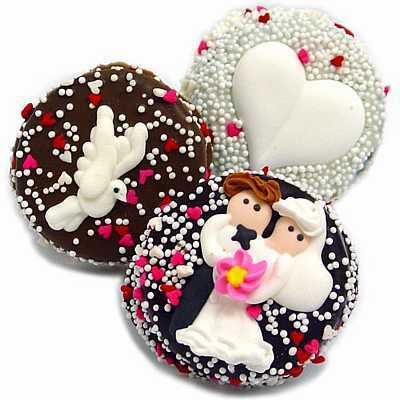 The chocolate dipped and decorated Oreo cookies can be decorated with a bride/groom, wedding assortments, baby showers, holidays, birthdays or sprinkles. You can be very creative and colorful with these chocolate decorated Oreo cookies. The chocolate covered Oreos may be purchased in bulk or in cellophane bags tied with a ribbon in the color of your choice. Price is per chocolate covered Oreo cookie. These chocolate dice are the perfect favor for your Las Vegas wedding favors. 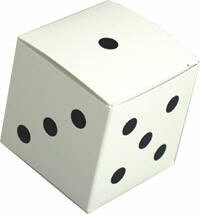 The chocolate dice are packaged in a box with a clear top so that your guests can see the wonderful treats! Each box has 6 chocolate dice, measuring ~1.5" square. The box measures 4 1/2" x 3 1/2" x 1". Total weight is 4.8 oz. Price is per box of 6 chocolate dice. Minimum order is 12 boxes. The chocolate dice comes in several different assortments, white chocolate (vanilla), dark chocolate, milk chocolate, or mixed. These can't be shipped internationally. They will need to ship via 2 day air or overnight. They will be shipped in ice packs. These can be shipped directly to the hotel or event site. If you will be traveling to Las Vegas or anywhere else and do not want to transport chocolate, this would be a great option. We would need a contact person, just to make sure that they know that it is coming and it is for your event. If you do not want the Las Vegas label on the box, please let us know. These are made fresh to order. These mint chocolate playing cards will be a hit at your Las Vegas wedding or poker parker. 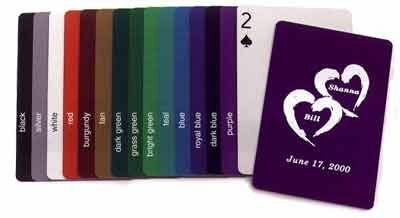 Mint chocolate playing cards make great wedding favors for a Las Vegas themed wedding or party. 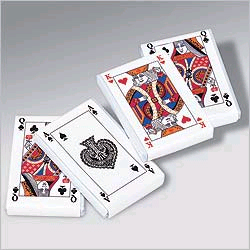 The chocolate playing cards are assorted aces, kings, queens, and jacks, a full house! These assorted milk chocolate poker chips are perfect for your Las Vegas wedding favors or poker party. The milk chocolate poker chips make great favors for your Las Vegas themed wedding or event. Solid milk chocolate, wrapped in foil to look and feel exactly like real $10, $50, $500 and $1000 casino gaming chips. 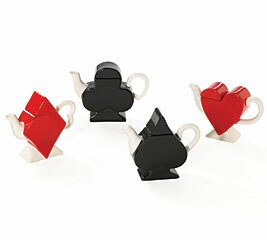 These are great for a "Don't Gamble On Love" Theme. Chocolate poker chip dimensions: 1 1/2 x 1/4 inches. Price is per pound. Must order in increments of 2 pounds. ~69 pieces per pound. These $100 black dark mint chocolate poker chips, $5 pink milk chocolate poker chips, or $25 green milk chocolate poker chips are perfect for your Las Vegas wedding favors or poker party. 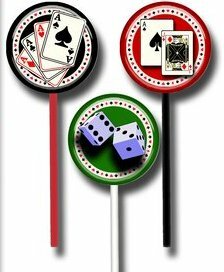 The dark mint chocolate poker chips make great favors for your Las Vegas themed wedding or event. Dark chocolate with pure peppermint oil, wrapped in foil to look and feel exactly like a $100 casino gaming chip or solid milk chocolate, wrapped in foil to look and feel exactly like a $5 & $25 casino gaming chip. . These are great for a "Don't Gamble On Love" Theme. Chocolate poker chip dimensions: 1 1/2 x 1/4 inches. Price is per pound. Must order in increments of 5 pounds. ~69 pieces per pound. 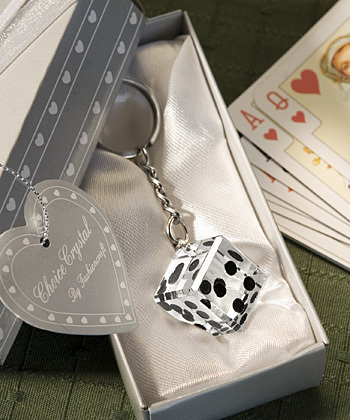 These chrome keychains have a crystal dice that is a sure bet for your Las Vegas themed wedding favors. They are adorable and unique. The crystal dice keychains are 3 1/2" x 1 3/4" and are packaged in a silver box adorned with hearts. The box is tied with a white ribbon and has a heart hang tag. Price is per crystal dice keychain favor. Minimum order is 18. Crystal dice paperweights are the perfect gift or wedding favor for a Las Vegas theme event. They are practical and elegant. The large crystal dice paperweight measures 2.5" square and is packaged in a black gift box. The small crystal dice paperweight measures 1.5" square and is packaged in a black velvet bag. Price is different for each size. 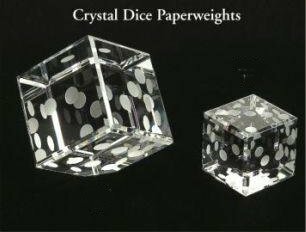 Price is per crystal dice paperweight. Must order in increments of 4. Custom poker chips are perfect for Las Vegas wedding favors or Vegas parties. The personalized poker chips are also great to have at home for those card parties with friends! These 11.5 gram ABS composite poker chips are hot foil stamped in gold, silver, black or white. They are not personalized with labels. The poker chip itself is personalized. The custom poker chips can be personalized 3 different ways: 3 letter initials/denominations, 2 letter initials, or logo with personalization. There is a $50 one time die charge for each logo design. It will be added manually if you choose a logo design. There is no die charge for 3 letter initials. 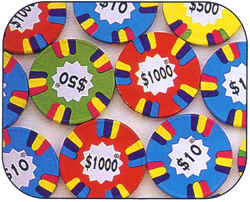 Custom poker chips are sold in sets of 50. Minimum order is 6 sets of 50. 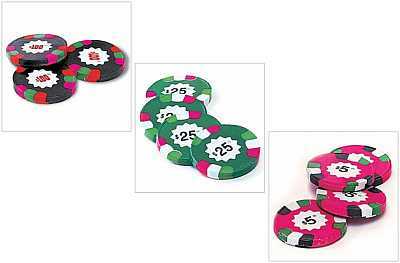 Price is per set of 50 personalized poker chips. You can order different color chips in increments of 50 to meet minimum, but the personalization must be the same. Price includes personalization on one side. Both sides can be personalized for a nominal fee. Add personalization in the comment field below. Poker chips usually have white accents. 1 to 2 weeks lead time before shipping. $50 rush fee for 4-7 days lead time before shipping. 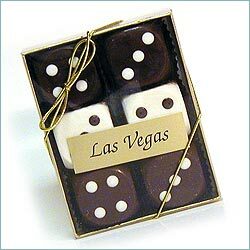 These dice truffle boxes are perfect for Vegas weddings or card party favors. You can put candy or a special trinket in the dice boxes. There are 3 sizes to choose from. Mini, 1 5/16" D, Small, 1 5/8" D, and Large, 2"D. Price is per box. Must order in increments of 25 after the minimum order of 50. Dice Candle These cute red dice candles are perfect for your Vegas or Casino themed event. 4" Price is per candle. Must order in increments of 3. This dice lip gloss is for all of the big rollers! It is so cute. There are 6 sides of lip gloss! 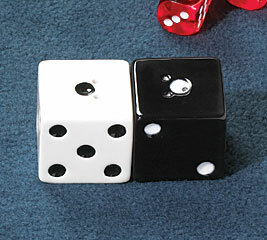 The dice lip gloss is great for parties, bridal showers, and Las Vegas weddings favors and gifts. Each dice measures ~1.5". Colors are assorted. These dice lollipops are so cute. These are perfect for Vegas parties or Vegas themed events. You can easily personalized by adding a personalized ribbon or tie a personalized hang tag. 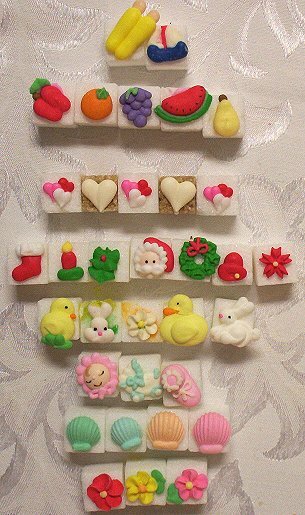 Each candy is 1" Diameter. These lollipops are 3 dimensional with hand painted dots. They really look like dice! There are 6 wonderful flavors/colors. Red - Cherry, Green - Lime, White - Pina Coloda, Orange - Orange, Yellow - Lemon, Purple - Grape, Ice Blue - Blueberry, Hot Pink - Cinnamon. Must order in increments of 24. Price is per dice sucker. 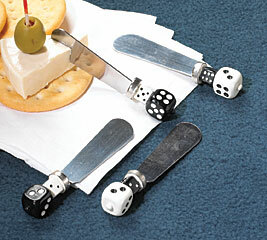 These dice salt & pepper shakers are the cutest favors for Vegas themed events or card parties. The dice salt & pepper shakers are handpainted ceramic. 1 1/2" High Price is per set of dice salt & pepper shakers. 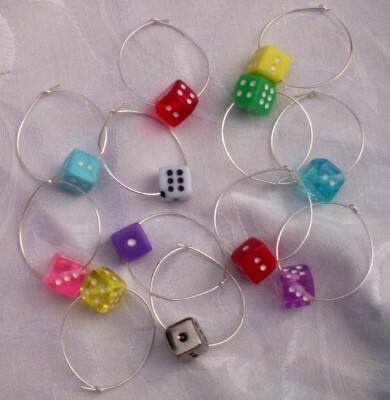 These cute dice wine charms are perfect for your Vegas themed event. Each set contains 6 assorted colors dice and are packaged in an organza bag. These are perfect for gift giving as well as functional. 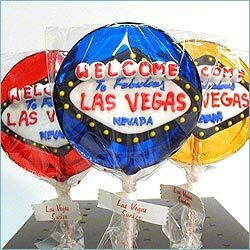 Embedded Vegas love lollies are perfect for very memorable occasions. They are a feast for the eyes. These custom lollipops have the graphic embedded inside of the lollipop to give it a 3-D effect. These embedded photo pops taste as great as they look. They are individually wrapped in clear cellophane bags for fresheness. The entire pop is in the bag, including the stick. There are 2 sizes available. 2"and 3". 2-3 week lead time before shipping once artwork is received. 100% edible and fruit flavored. Made in the USA, Kosher Approved. Price is per embedded love lollipop. Minimum order is 144. Please put your personalization in the comment field below. Price is per embedded love lollipop. Minimum order is 12. 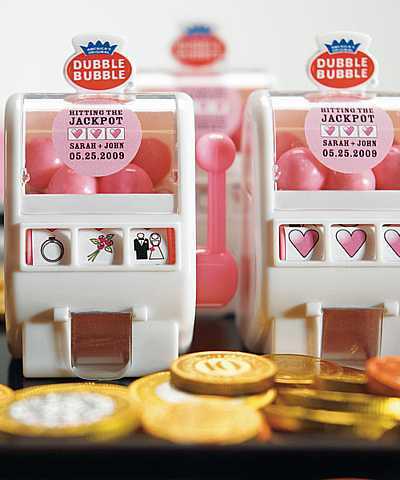 These cute gumball jackpot slot machines are perfect for Las Vegas themed wedding favors. They are perfect for kids and adults. Price is per set of 12 assorted gumball jackpot slot machines. Mini Gumball Slot Machine Hit the jackpot with these slot machine gumball dispensers, perfect for guests of all ages or as a special gift for your youngest guests. 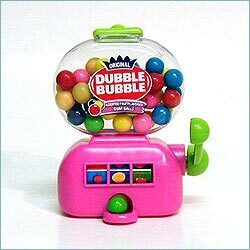 Just spin the wheel and be rewarded with an authentic Double Bubble every time. These mini gumball slot machines are perfect for Las Vegas wedding favors. Price is per mini gumball slot machine. Minimum order is 12. This category has a total of 41 products divided in 28 per page.